Our products require Type Approval Certification. 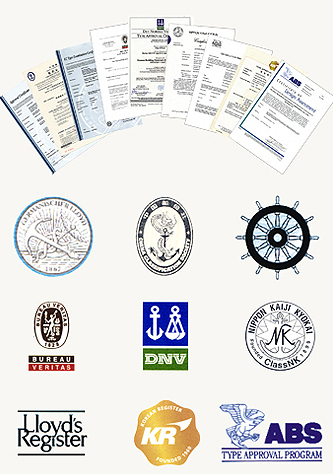 All products offered by Ships' Accommodation Solutions Ltd are certified to latest IMO-SOLAS Rules & Regulations. Type Approvals are available from most National Authorities and Classification Societies – e.g. All products detailed in this catalogue have been tested according to the latest International Regulations and Test Procedures. All components of these products are constructed of approved non-combustible materials and all decorative surface coatings are of approved low flame spread materials. All products supplied are totally asbestos free. These products are exposed to fire for 30 minutes and comply with stability and integrity requirements of Resolution A754 ( 18 ). The ratings, B-0, B-15, B-30, indicate the insulation value of the product within given temperature limits. These products are exposed to fire for 60 minutes and comply with stability and integrity requirements of Resolution A754 (18). The ratings, A-0, A-15, A-30, A-60, indicate the insulation value of the product within given temperature limits.